Genomic copy number variants (CNVs) are a common, heritable source of inter-individual differences in genomic sequence. Their influence on phenotypic variability and their involvement in the pathogenesis of several common diseases is well established and the object of many current studies. In the course of examining CNV association to various quantitative traits in a general population, we have detected a strong association of CNVs over the four TCR genes to lymphocyte and neutrophil numbers in blood. In a small replication series, we have further characterized the nature of these CNVs and found them not to be germline, but dependent on the origin of analysed DNA. Germline deletion and rearrangement around the T-cell receptor (TCR) genes naturally occurs in white blood cells. 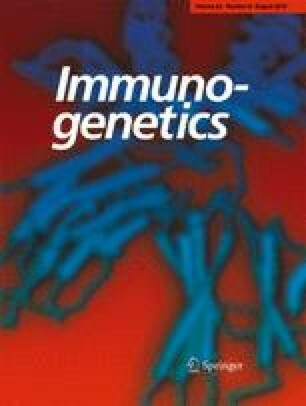 Blood DNA derived from persons with high lymphocyte counts generates variable intensity signals which behave like germline CNVs over these genes. As DNA containing a relative high proportion of these CNV-like events involving the TCR genes has the ability to influence genotype counts of SNPs in the regions of these genes, care should be taken in interpreting and replicating association signals on variants within these genes when blood-derived DNA is the only source of data. The online version of this article (doi: 10.1007/s00251-010-0459-7) contains supplementary material, which is available to authorized users. The authors are grateful to the study participants for their participation and collaboration in this research project.The authors acknowledge the help of Stefan Waldner in recruiting the follow-up cohort. We thank Clemens Egger and Yuri D’Elia for technical support, Langes Martin and Roberto Gambato for performing the immunological typing, and Deborah Mascalzoni and Mirko Modenese for their support in ethical and statistical issues. This work was supported by the Ministry of Health of the Autonomous Province of South Tyrol and the South Tyrolean Sparkasse.